Salamanca is Madrid’s most exclusive neighbourhood and its ‘Golden Mile’ of designer stores is a great place to wander, even if you’re just window shopping. We take a look at some of the best home-grown designers to visit in Salamanca, Madrid. Agatha Ruiz de la Prada first came to prominence during La Movida Madrileña, the countercultural movement that sprung up after the death of General Franco and Spain’s return to democracy in the late ’70s and ’80s. It was a time when the worlds of music, fashion and film collided and Prada became known for her bright, wacky-patterned clothes. The aesthetic remains – expect polka dots, stripes and quirky colours that look like they’ve just been plucked out of a sweet shop. The brand does women’s, men’s and children’s clothing as well as accessories. Spanish designer Felipe Varela specialises in feminine silhouettes fit for a queen – in fact, he is one of Queen Letizia’s favourite designers; she wore a Varela design to the wedding of the Duke and Duchess of Cambridge in 2011. This 600-square metre department store is a one-stop-shop for everything from high-end fashion to gourmet food. Its make-up and perfume department is extensive, while it is also home to accessories, books, gifts and a delicatessen. Its bookshop was designed by French designer Philippe Starck and when you need a little break, you can stop for a drink at the Moët and Chandon champagne bar. This Spanish luxury brand has been making leather bags and accessories since it was founded in 1846 in Madrid by a group of leather craftsmen. The brand is known globally for its exquisite leather bags for men and women, as well as its ready to wear line and accessories. 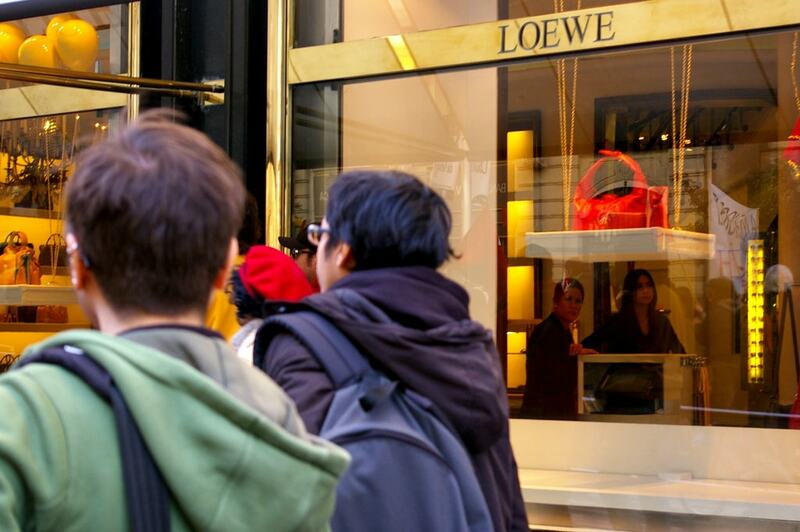 Although Loewe has stores around the world, its products are still manufactured in Madrid. Casa Loewe, the brand’s flagship store in Madrid, is worth a visit for the beautiful architecture alone. This Spanish luxury jewellery brand focuses on cool, young designs with a wide range of prices to suit almost every budget. From beautifully-designed sterling silver earrings to 18-karat gold brooches and necklaces, the wide range of products is well worth a browse. The brand also does watches and diamonds – if you really want to splash out and treat yourself on your next visit to Madrid. This traditional tailor, founded in 1914, specialises in hand-made suits and has been decking Spanish men out in English gentleman style for over a century. Its concept store, in the Salamanca neighbourhood, aims to recreate the feel of home, so customers can look around the elegant surroundings in the utmost comfort. Blahnik, born in the Canary Islands, is one of Spain’s most famous designers, thanks in part to being the shoe of choice of a certain Carrie Bradshaw. Since he opened his own boutique in the early 1970s, Blahnik’s feminine, glamours designs have been a favourite of in-the-know fashionistas around the world.